Under the ACA, companies are provided a way to determine who is a full-time employee, and when and how long to offer the full-time employee health coverage. The measurement period is used to measure the hours worked for hourly workers. If an hourly worker has worked over 130+ hours per month for the entire measurement period, they are considered to be a full-time employee by the IRS. All full-time employees are required to be offered health coverage that is effective for the entire stability period. The stability period typically begins on the health plan renewal and lasts 12 months. At the end of the measurement period is a 2 month admin period where employers should offer health plan coverage to all of their known full-time employees. The initial periods are reserved for new-hires because they are typically hired outside of the standard periods. The new-hire measurement period begins on the 1st of the month after their start date. For example, if an employee is hired on Mar 5, 2016, their measurement period will begin on Apr 1, 2016. When the initial measurement period ends, the initial admin period begins and lasts for 30 days. If the new hire was measured to be full-time, you must offer them coverage for the entire initial stability period. It's important to note that a new-hire will actively be measured on both the initial measurement period AND the standard stability period at the same time. Once the initial measurement period ends, the standard measurement period takes over for the employee. 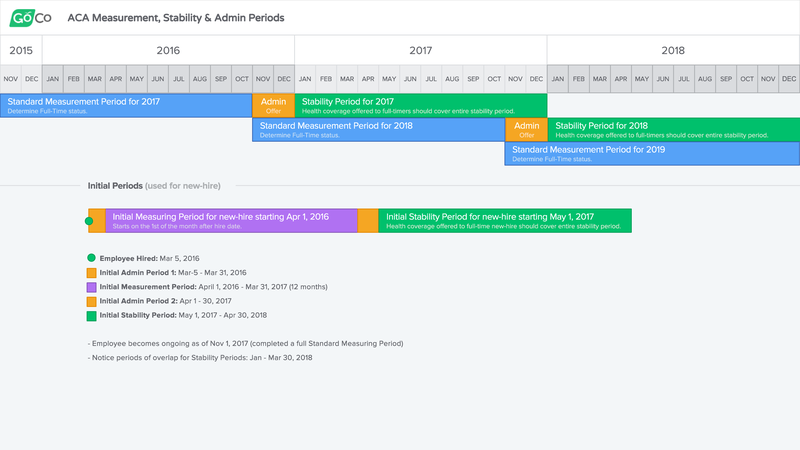 Here's a visual demonstrating the measurement, stability, and admin periods alongside the initial periods for new-hires.